The smell is a bit “weird”, in lack of better word to describe it. Serums are new for me. They are supposed to contain nutrition and anti-aging ingredients. I thought the anti-aging part wasn’t for me, but as I started noticing the fine lines on my forehead I decided to give this serum a go. Emma S. is the brand of swedish supermodel Emma Sjoberg, now known as Wiklund. She became famous in Sweden starring in a milk commercial, and to the rest of the world by being one of those long legged wonder women in George Michael’s videos in the 90s. In interviews Emma has been open about starting this company with funds of her own, saved up from her modelling career, which deserves respect in an era where celebrities live of franchise. She also talks about how retouching did not exist during her modelling years, so your skin had to be perfect otherwise you would be sent home and how she worked with skin therapists whose approach were closer to those of dermatologists. So this lady knows spotless skin and has done her research during all those years living in Paris. How I know she lived in Paris? She has a perfume smelling of the street she lived on (I own it and can assure you it was one of the better smelling streets of the city). Back to the serum: I was very curious of Emma had achieved and was not disappointed. You are supposed to use a serum before your day/night cream. I was worried two layers of cream would grease up my sensitive skin. But I have actually not experienced any spots of break-out after starting to use it. My skin feels very smooth and I’m not proud of admitting this, but usually when I’m tired I’m not very confident not wearing make-up since I feel that I look like a pale ghost – but after starting to use this skin my skin has felt so flawless that I started ditching make-up more frequently. The serum comes in a pump bottle, which is hygienic. You need two pumps per use, which makes it last long, and it sinks in pretty fast. The negatives are that it doesn’t smell too good and it is a bit pricy (around 40 dollars). 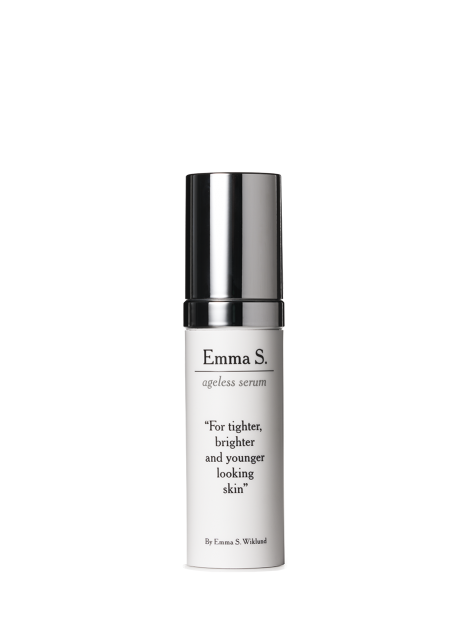 I can’t say anything about the anti-aging effect since I believe you need years to judge, but overall I was impressed with this product and I will invest in more products from Emma S.
I love this! If you haven’t tried the enzyme peel from Emma S you must!! Intrigued! Love that she was a super model before retouching, so you’re spot on that she knows good skin. Will put this on my beauty shopping radar.